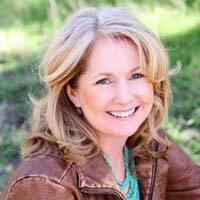 Laura Purdie Salas is the author of more than ninety books for children and teens. That’s right, NINETY! 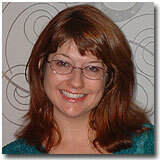 Before becoming an author she was a magazine editor, an 8th grade English teacher, and a freelance writer for adults. I had the pleasure of participating in one of Laura’s online classes in 2008. I knew right away that, besides being a genuinely adorable and generous lady, she is a topnotch professional with skads of experience. So, I was thrilled when she agreed to join me here. Welcome to my little corner of cyber space, Laura! Congratulations on the success of your recently released poetry book. Booklist describes STAMPEDE! : POEMS TO CELEBRATE THE WILD SIDE OF SCHOOL (Clarion, 2009) in this way: “The wild verses are positively shot through with simile and metaphor, and young readers will run just as rampant, flocking to these pitch-perfect portrayals of their peers and selves.” Tell us about this books’ journey to publication. Thanks, Donna! 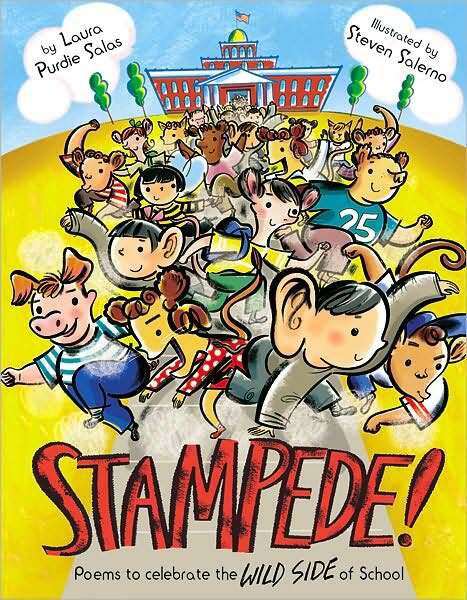 STAMPEDE was my first book for a mainstream trade publisher, and it was a long time in the making. A few months later, I visited her classroom to lead the kids in some poetry. We all wrote poems that compared ourselves to animals. Those poems stayed in my head, and I thought a whole collection of them would be fun. Soon, tons of poems comparing kids to animals were thundering through my brain. That was in 2003. I started submitting the manuscript to publishers in 2004. In late 2005, I sent it to editor Jennifer Wingertzahn at Clarion (an imprint of Houghton Mifflin). We had a few conversations the following year, and in September 2006, she made an offer on the book. The book came out three years later, and I couldn’t have been happier with how it came out! How did you come to write for educational publishers? In October of 1999, I went to a local (Minnesota) SCBWI conference. Editors from two educational publishers, Capstone Press and Lerner spoke at the conference. Because I was a conference volunteer (always a great idea), I got to be one editor’s helper and I got a manuscript critique with the other. I followed up with both of those editors, and I ended up writing books for both companies. So the initial impulse just happened because of the situation. But then I went about it methodically and professionally. Can you give us a few examples to show the wide range of nonfiction subject matter you’ve tackled for different age groups? How do educational publishers differ from trade publishers? The most important, basic difference is that with educational publishers, you are assigned what book to write, and you write it the way the publisher wants it written. It’s kind of like being a reporter for a newspaper, where you are assigned stories. With trade publishers (99% of the books you see in bookstores are from trade publishers), you write the book first, and then try to find a publisher to publish it. How does a work-for-hire contract differ from a royalty contract? In a wfh contract, the company that makes the assignment (the publisher) owns the work you produce. They pay you, the writer, a definite, agreed-upon amount, whether the book sells 10 copies or 10,000. In a royalty contract, you earn a percentage of the book sales. So if a book takes off, wins major awards, or something like that, you earn more money. Though the sad reality is that many, many books (especially picture books) never even earn out their advance (which is the money the publisher gives you up front, and it’s an advance against your royalties, in the same way you might get an advance against your paycheck—you don’t start earning royalties until your book has sold enough copies to “earn out” your advance). That means the advance, in many cases, is all the money the author earns. Do educational publishers publish only series? In 99% of cases, yes. They publish in series, and the book you write will be part of a series, so you write it to match that series. Unlike trade books, where you want your voice to stand out and be totally original and different, in ed publishing, you have to be a chameleon and blend in to any series you’re part of. Do educational markets publish only nonfiction? What parameters are typically included in an assignment to an author? This varies widely. But generally, you know the number of pages, the word count, the audience age, how it will be illustrated (with photos or art), and the general content you’ll cover. Sometimes they’re very specific: Chapter One will be the history of the sport. Chapter Two will be safety issues, etc. Other times, they are more general. This 32-page book of 800 words will cover mammals, their identifying characteristics, their variety, some extreme examples, their life cycle, and their range. If it’s an existing series, then the publisher will usually send you copies of other books in the series, so that you’ll have good examples to follow. Educational books have always been a mainstay of school libraries. Do you think books by educational publishers today are different than they were twenty years ago? Very different! Educational publishers today are aiming to not just provide accurate information but to also engage and entertain kids. The “report-style” book is slowly but surely giving way to appealing nonfiction that kids read because they want to! This is especially obvious as I look at the books I’ve done for K-3. Alphabet books, Q&A books, books organized around colors (like The Colors of Sports, or The Colors of Fall)…Nonfiction books take all kinds of fun approaches to learning. What resources should a prospective writer use to identify educational publishers? Go to your local elementary school and talk to the media specialist there and browse their nonfiction shelves. Every time you see a series, pop it out, skim it, and note the publisher’s name. If you’re a member of SCBWI (which I highly recommend), they have a directory of educational publishers available online. The Children’s Writer’s & Illustrator’s Market, an annual market directory from Writer’s Digest, lists some educational publishers. Join NFforKids, a Yahoo group, and check out people’s signature lines at the bottom of their emails. Many people on the list write for educational publishers, and you’ll see various publisher names there. Check out the Yahoo Directory of educational publishers. Are publishers looking for writers with a teaching background or English degree? Of course, that doesn’t hurt. But really, you don’t have to know all about curriculum standards and such to do this writing. If you have that background, great! Make sure to tell the publisher. But if you don’t, you can still break in. What editors are most looking for are professional writers who can research well, write clearly and accurately, follow directions, and turn their manuscripts in on time. So emphasize those abilities! What advice do you have for authors interested in writing for this market? Make yourself a list of educational publishers. Study their websites, request their catalogs, and try to read some of their books, if possible. Then create introductory packets with a great cover letter (make it specific to each publisher, mentioning some of their series or titles), a writing sample or two, a resume if relevant, and a reply envelope or postcard. The purpose of your packet is to introduce yourself and ask for assignments. Then wait, follow up, wait, follow up…until you get your first assignment! If you’re persistent and professional, you can do it! Laura teaches several online classes, including “Writing Children’s Books for the Educational Market,” several poetry classes, and even a support group/goal setting class for writers. If anyone’s interested in being on my monthly update list where I announce classes and events, you can email me from my website. No spam—just one email per month, at most. Also, I haven’t taught this online class this year because of a huge freelance project. I might be offering it again in the first half of 2011, but meanwhile, I’ve created a self-paced textbook that includes all the material from my class. You can read more about it here. To find out more about Laura Purdie Salas, her many online classes, and her resources for writers, visit her website at www.laurasalas.com and her blog at http://laurasalas.livejournal.com.